SymmetricDS is open source software that is free to use. It includes command line tools, documentation, and example configuration files for getting setup and running. The community provides support through the project website, forums, and issue tracker. SymmetricDS Pro is commercial software available from JumpMind as part of a support subscription. 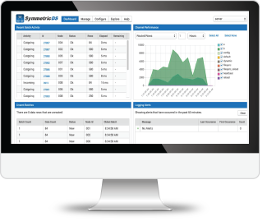 It includes a web interface to simplify configuration, monitoring, and troubleshooting. JumpMind provides technical support, maintenance, patches, and bug fixes. Try SymmetricDS Professional Edition for free during a 90-day evaluation period. Your system needs Java version 8 or newer. Supported operating systems include Windows, Linux, Solaris, HP-UX, AIX, and Android. Looking for a different version of SymmetricDS other than the latest release? Check out the Files Download section on SourceForge. SymmetricDS is free software licensed under the GNU General Public License (GPL) version 3.0. If you need to redistribute SymmetricDS with commercial software, a commercial license is available with SymmetricDS Pro. For details on a specific database system, see the Database Notes in the User Manual.